A super tasty, spicy pork dish. Quick and easy to prepare, perfect for a midweek feast! Dwaeji Bulgogi, or Daeji Bulgogi (돼지불고기) is a dish that is bursting with flavour and spicy goodness. Including time for marinating it can be cooked in as little as 40 minutes. It consists of tender slices of pork that have been marinated in a special red chilli paste sauce and then pan cooked or grilled. 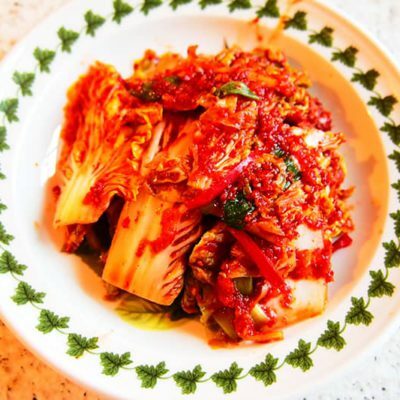 The recipe is similar in process to that of Bulgogi, one of Korea’s most popular dishes. The main difference with Dwaeji Bulgogi is that it is made with pork (instead of beef) and is spicy, whereas Bulgogi is not. Thinly slice the pork and place into a mixing bowl. Slice the onion and add all of the sauce ingredients to the bowl. For the kiwi we're really after the juice as it will tenderize the pork during marinating. After I've peeled the kiwi I normally use a grater and just grate it into the bowl. Mix everything up well so all of the pork is covered in sauce. I find it easier to mix by hand, but don't forget to wear a glove if you do! Once mixed, cover with cling film and pop in the fridge to marinate. Leave it in there for a minimum of 30 minutes. An hour is better if you have the time. Heat up a griddle pan over a medium/high heat and transfer everything from the bowl. Continue to cook for about 5 minutes until the pork is cooked through. Slice the spring onion and apply as garnish. Dwaeji Bulgogi is best eaten with a bowl of white rice. * If you want to eat it like a true Korean you can wrap a small amount of the cooked pork up in a lettuce leaf (I use Round lettuce) alongside a spoonful of rice and a small amount of kimchi to make an amazing parcel that is full of flavour and bursting with goodness.